mHealth has undoubtedly made significant progress over the past decade. Yet, tools such as physical activity trackers are rather naive as fitness coaches: they can tell you how much you walk, but not what you can do to perform better. In an ongoing project, we are trying to inquire into whether part of the intelligence of activity trackers can be crowdsourced. As an example, CrowdWalk is a mobile app that leverages the wisdom of the crowd to produce location-based “walking challenges”, and thus attempts to assist behavior change through highlighting opportunities for physical activity. CrowdWalk infers users’ location and presents a list of walking activities that can be initiated from one’s current location. For instance, as users enter a building CrowdWalk may suggest taking the stairs. When entering a supermarket, users may be challenged to leave their shopping cart behind while walking back and forth to gather shopping items. With the design of CrowdWalk, we aim at fostering an alternative approach to the dominant narrative of quantification in health-promoting technologies. Ornelas, T., Caraban, A., Gouveia, R., & Karapanos, E. (2015). 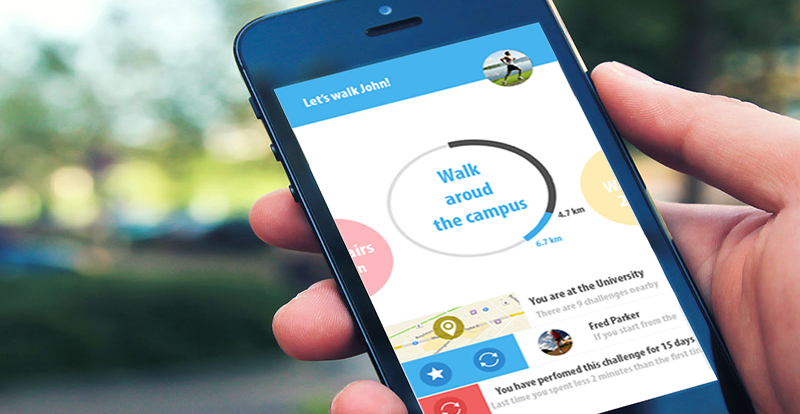 CrowdWalk: leveraging the wisdom of the crowd to inspire walking activities. In adjunct proceedings of Ubicomp’15 (pp. 213-216). ACM.